The Chandler family spent over a century helping to build Los Angeles with the town’s newspaper of record, the LA Times. The paper was kept in the family from 1882 until 2000, with Norman Chandler at the helm during World War II. But newly released FBI files show that Norman may have had some particularly nasty friends in the 1930s. Specifically, Nazi friends. I recently filed a Freedom of Information Act request with the FBI for Norman Chandler’s files which, much to my surprise, hadn’t been released before. While historians know that Chandler visited Germany in the 1936 for the Olympic Games, and reported favorably on the Nazi regime, these new files reveal that Norman was allegedly hobnobbing with Nazis in Los Angeles as late as 1938. Norman Chandler didn’t became publisher of the Los Angeles Times until 1944, but the entire Chandler family was intimately involved in the paper’s operation. Before becoming publisher in 1944, Norman was general manager in 1936 and became president of the Times in 1941. Chandler openly chastised those in the press who questioned the Nazi regime in 1936. 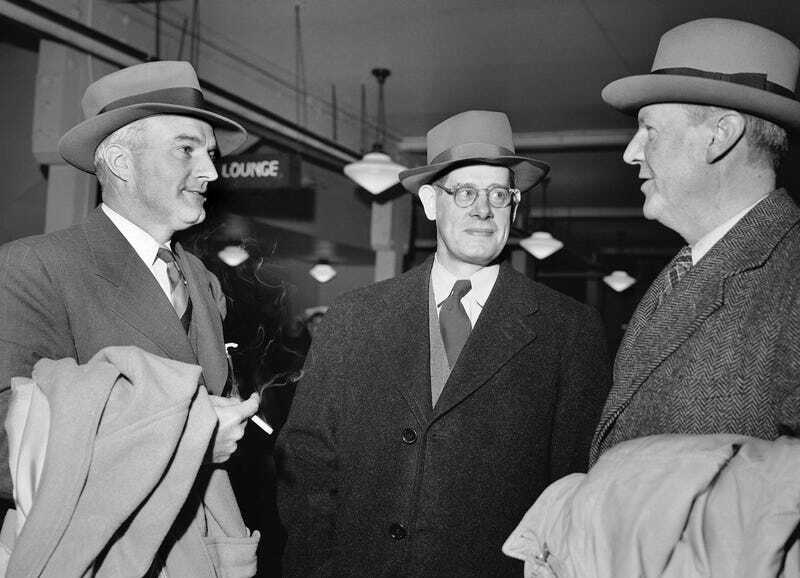 At a lunch with business owners and two other members of the press who had reported from Berlin, Chandler came down hard on Ralph Barnes of the New York Herald Tribune and William Shirer from CBS. Chandler demanded to know why they were being so critical of the Nazi government when their reports contradicted what Chandler and others had “seen with their own eyes.” Shirer apparently pressed Chandler on what he meant, according to a biography on William Shirer from last year. “They had talked to [Hermann] Göring and he had told them that we American correspondents in Berlin peddled nothing but lies about National Socialist Germany,” Shirer would write later about the lunch with Chandler. Göring, of course, would be sentenced to execution at Nuremberg after WWII for war crimes. He committed suicide in his cell before he could be hanged. Chandler’s defensiveness for the Nazis had obviously come from firsthand experience, as we now don’t have to just take Shirer’s word that he was visiting with top Nazi brass. The newly released FBI file indicates that he’d been given letters of introduction to “high ranking Nazi officials” when he visited Germany during the mid-1930s, though it’s not clear who else he may have met, aside from Göring. Chandler, a friend of J. Edgar Hoover, was later asked by the FBI about these letters of introduction in 1941, once the US had entered World War II, and Chandler insisted that, “if such letters had been written his brother, Harrison Chandler, would probably be the person informed about them.” The FBI file doesn’t expand any further on the letters. Needless to say, I’ve put in a FOIA request for that specific file (65-16543-30) to see if we can’t learn more about who might be these other “well-known Nazi sympathizers” partying the night away in Los Angeles. Judging by the file, Chandler and Hoover were buddies. The file both opens and closes with cordial letters between J. Edgar Hoover and Norman Chandler. Or, in the case of the last letter, a note from Hoover to Chandler’s widow expressing his condolences. But during the in between, like in this memo from 1947, we see that Chandler and Hoover would meet to discuss things. As long as it didn’t interfere with Chandler’s dentist appointments. By the end of World War II, Chandler seems to have made amends in some ways for his defense of the Nazi regime during the 1930s, if you believe that he was truly unaware of the atrocities they were committing. He was among a host of news executives who visited Germany after the war to see the horrors of the Holocaust firsthand. Chandler seemed to have changed his tune by 1945. The publisher was one of a group of American newspaper executives who flew to Europe at the invitation of General Eisenhower to see conditions in prison camps and elsewhere. The file also contains mention of a Better Business Bureau meeting in 1955 that I really can’t make heads or tails of, but I’m sure someone smarter than myself might be able to figure out. I’ve uploaded the entire document below. Let me know if you spot something weird that I missed. Correction: I originally misstated that Hermann Göring had been executed at Nuremberg. He was sentenced to execution but committed suicide before he could be hanged.